SAN JOSE -- Head Coach Dave Tippett announced on Saturday that center Martin Hanzal will join Keith Yandle as an alternate captain for the Coyotes for the 2011-12 season. Martin Hanzal. Photo by Getty Images. "It's a great honor, especially on a team that has Shane Doan as captain," Hanzal said. "He's a great captain and I'm really looking forward to being his assistant captain. I will definitely keep playing the way I have been all these years, but with the "A" comes more responsibility. I will be a good example for the younger guys and everyone else because that is what assistant captains do." Doan, of course, is serving as team captain and Keith Yandle will be the first alternate. 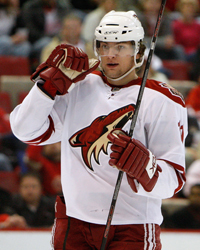 Like Doan and Yandle, Hanzal has played his entire career with the Coyotes, the team that selected him in 2005 with the 17th overall pick of the NHL Entry Draft. In 288 games, Hanzal has notched 46 goals and 79 assists. On Thursday, he signed a five-year contract extension. Hanzal said he was caught off guard when Tippett informed him he would be wearing an 'A' on his sweater this season. "I'm shocked," Hanzal said. "I wasn't trying to be named assistant captain. I was just doing my job and it just happened."